Adriaen van de Velde (1636–1672), The Hut (1671), oil on canvas, 76 x 65 cm, Rijksmuseum Amsterdam, Amsterdam. Wikimedia Commons. 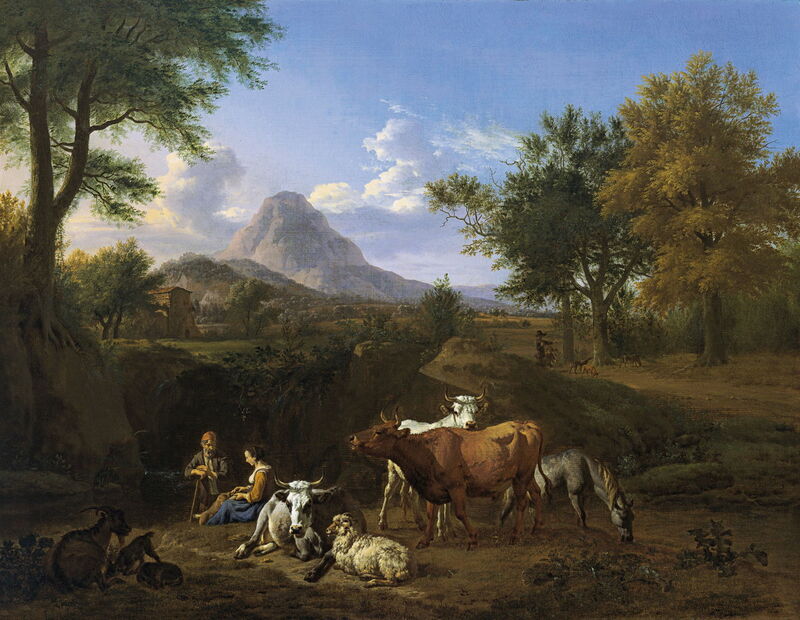 I previously covered the tragically short-lived Paulus Potter (1625–1654) in this series, unaware that one of his successors in the Dutch Golden Age also had a very brief career: Adriaen van de Velde (1636–1672), best known for his fine landscapes and farm animals. Van de Velde was born into an artistic family – his father and brother were marine painters of repute – and was baptised in Amsterdam. In the first instance he is believed to have been trained by his father. Adriaen was quickly recognised as being exceedingly gifted as a painter. It is not known whether he received any training from another master, but his older brother Willem was trained by Simon de Vlieger. Unlike Willem who continued to work with his father, Adriaen established an independent studio, where he specialised in landscapes, and painted a few religious and narrative works. One technical problem unfortunately plagues van de Velde’s paintings: his use of a fugitive yellow, probably a lake, in his greens, which has resulted in most of those greens becoming blue. This is most apparent in his paintings from 1662 onwards. Van de Velde collaborated with Jan van der Heyden in several paintings: van de Velde brought his skill with figures, and van der Heyden his with buildings and the urban landscape. Although the results are often superb, I have not included any in this short article. 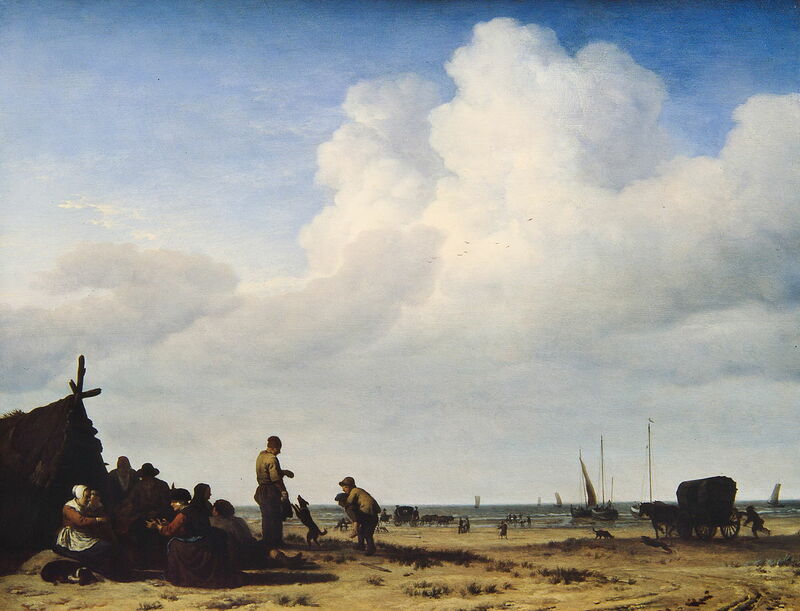 Adriaen van de Velde (1636–1672), The Beach at Scheveningen (1658), oil on canvas, 52.6 x 73.8 cm, Gemäldegalerie Alte Meister, Kassel, Germany. Wikimedia Commons. 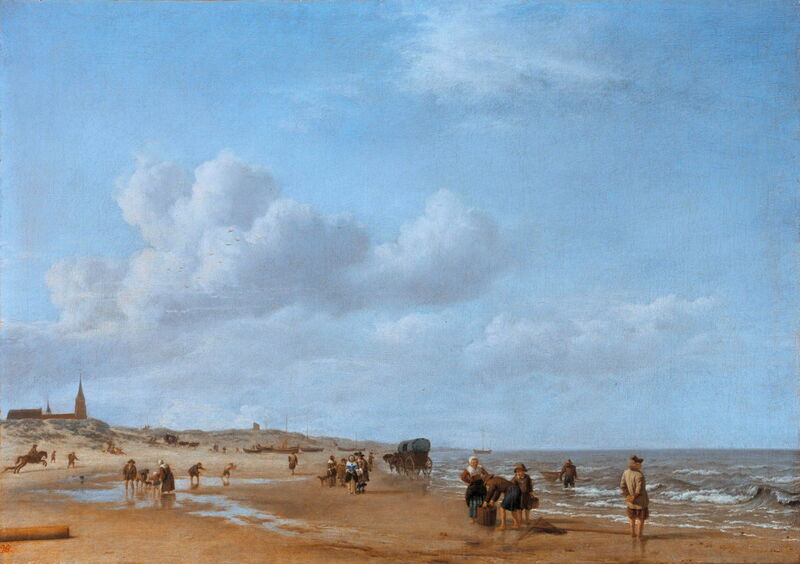 Among his earliest surviving paintings are several beach scenes, including The Beach at Scheveningen (1658), which are exceptional for someone who was only twenty-one at the time. Despite the dress and wagons, this has a timeless quality, and gives the most wonderful impression of light and space. Adriaen van de Velde (1636–1672), A Farm with a Dead Tree (1658), oil on canvas, 54.2 x 62.5 cm, The National Gallery (Bought, 1871), London. Photo © The National Gallery, London. He also showed his talent early in A Farm with a Dead Tree (1658), which must be one of the finest landscapes from the period. 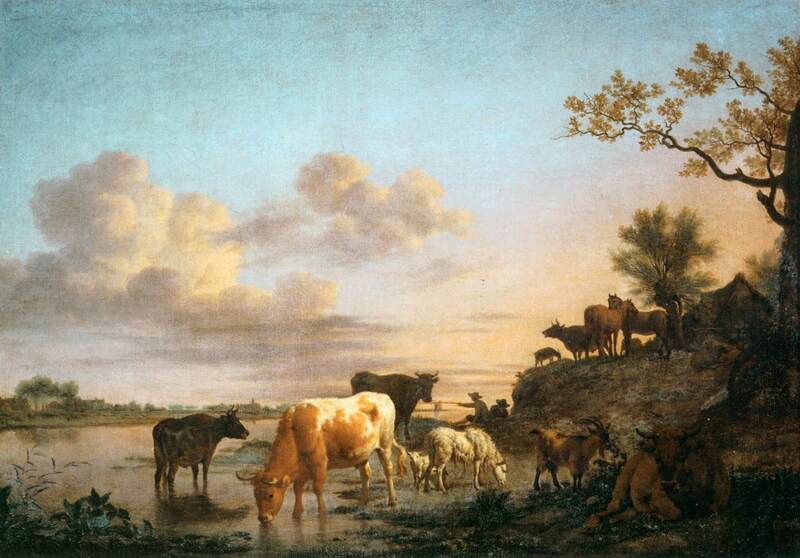 It has compositional similarities with Paulus Potter’s Driving the Cattle to Pasture in the Morning (1647) (below), and both artists drew attention to the bull’s horns by setting them against the sky. Adriaen van de Velde (1636–1672), Mountainous Landscape with Cattle (1663), oil on panel, 31 x 36.5 cm, Rijksmuseum Amsterdam, Amsterdam. Wikimedia Commons. 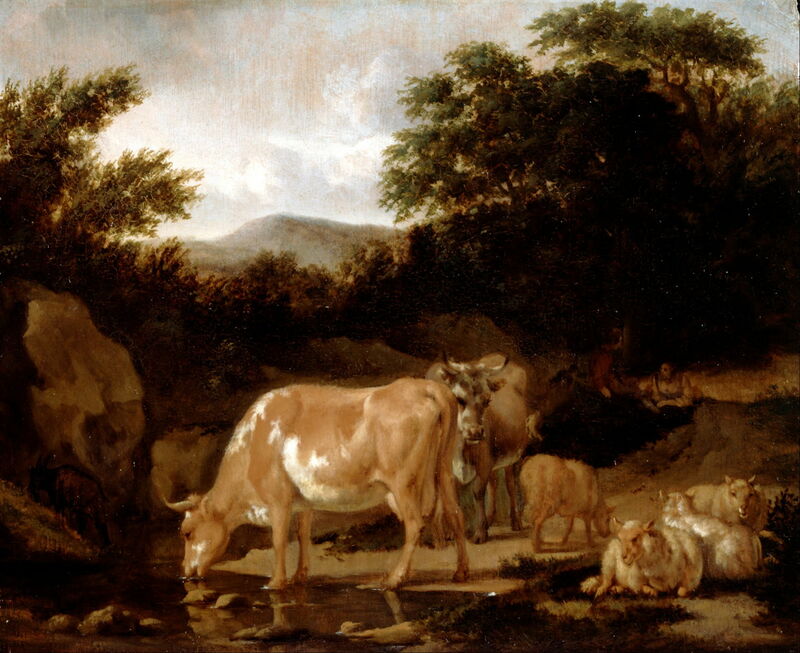 Van de Velde was most productive in the early to mid 1660s, when he completed a series of different landscapes featuring portraits of cattle, including the small panel of Mountainous Landscape with Cattle (1663). 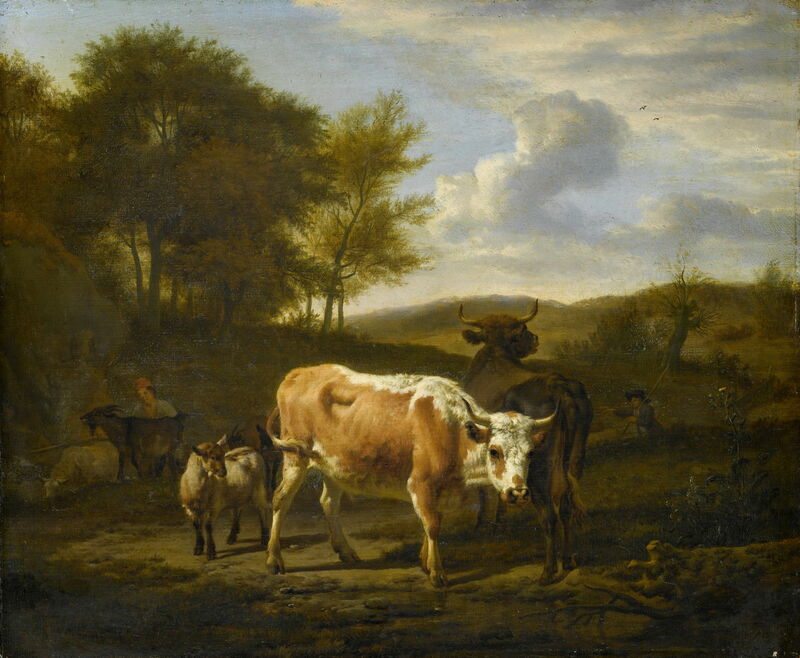 Adriaen van de Velde (1636–1672), Wooded Landscape with Cattle (1663), oil on panel, 29 × 35.5 cm, Koninklijk Kabinet van Schilderijen Mauritshuis, The Hague, The Netherlands. Wikimedia Commons. 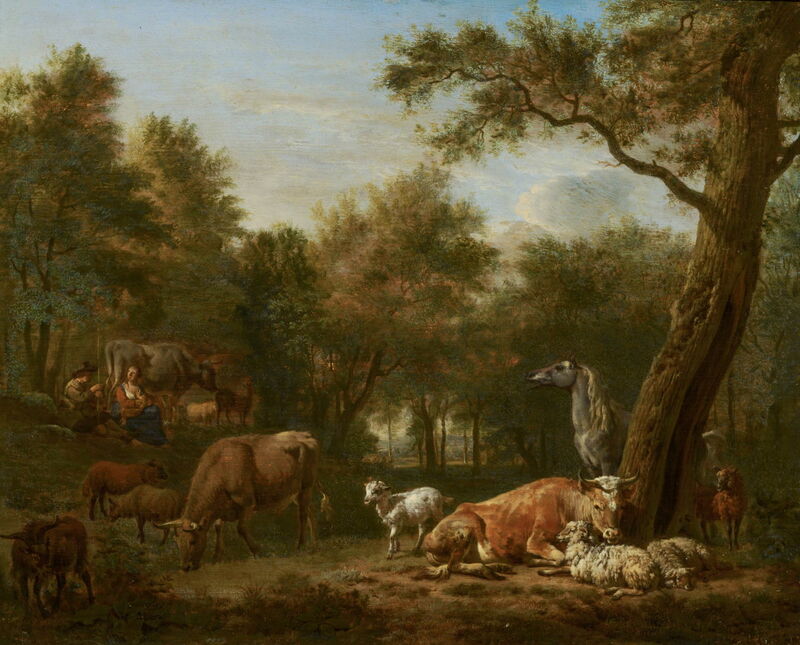 Wooded Landscape with Cattle (1663), another small panel, includes a richer menagerie of farm animals, with different varieties of sheep, cattle, possibly goats, and a sturdily-built horse. 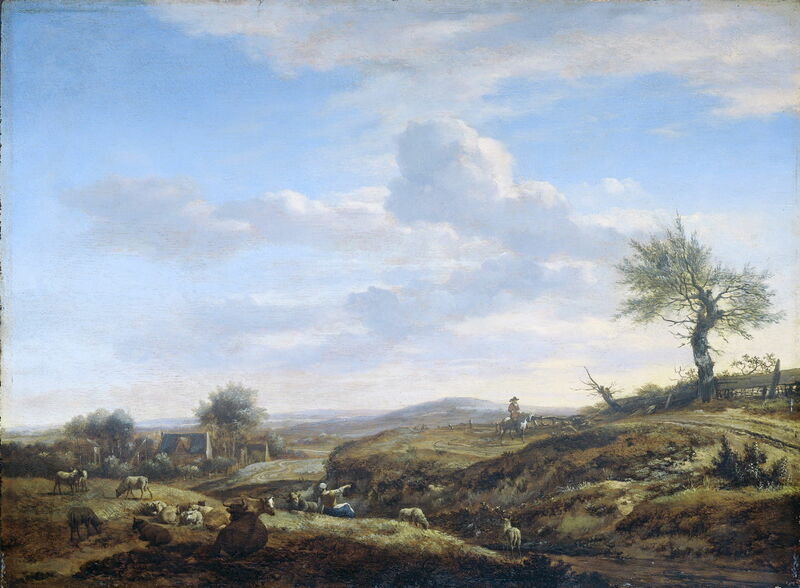 Adriaen van de Velde (1636–1672), Pastoral Scene (1663), oil on canvas, 48.5 x 62.5 cm, Museo Thyssen-Bornemisza, Madrid. Wikimedia Commons. His Pastoral Scene (1663) is a slightly larger canvas, which combines figures and animals in the foreground, wonderful depictions of trees, and a slightly incongruous distant mountain. Amazingly, this sold at auction for as little as £12,000 back in 1977, which seems ridiculously cheap for such a classic landscape. Adriaen van de Velde (1636–1672), Hilly Landscape with High Road (c 1663), oil on panel, 28 x 39 cm, Rijksmuseum Amsterdam, Amsterdam. Wikimedia Commons. Hilly Landscape with High Road (c 1663) is more modest in its hills, and has rather richer staffage. Adriaen van de Velde (1636–1672), View of a Beach (1663/1665), oil on panel, 42 x 54 cm, Koninklijk Kabinet van Schilderijen Mauritshuis, The Hague, The Netherlands. Wikimedia Commons. View of a Beach (1663/1665) is a more mature beach scene which perhaps lacks the freshness of his early paintings at Scheveningen, but is still masterly. 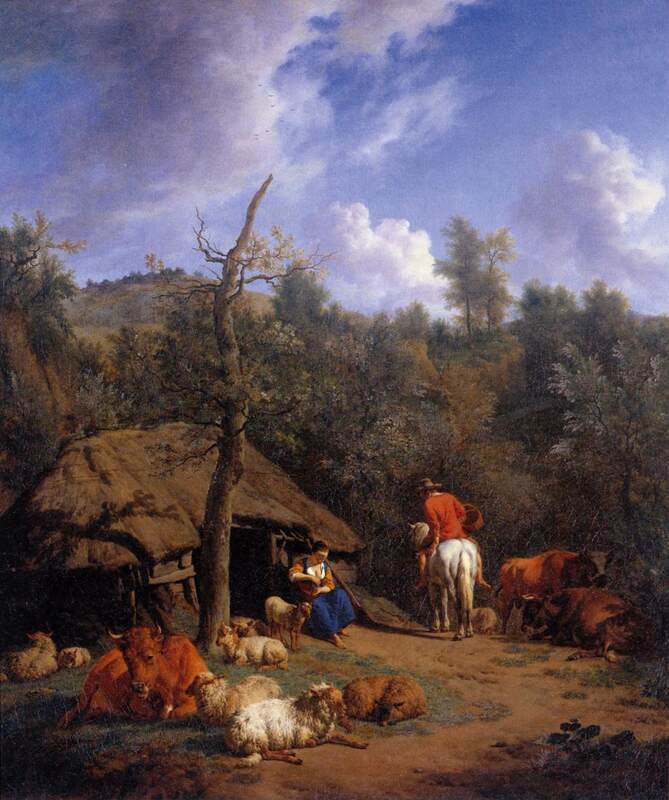 Adriaen van de Velde (1636–1672), Cows and Sheep in a Wood (date not known), oil on panel, 18.4 x 22.5 mm, Dulwich Picture Gallery, London. Wikimedia Commons. 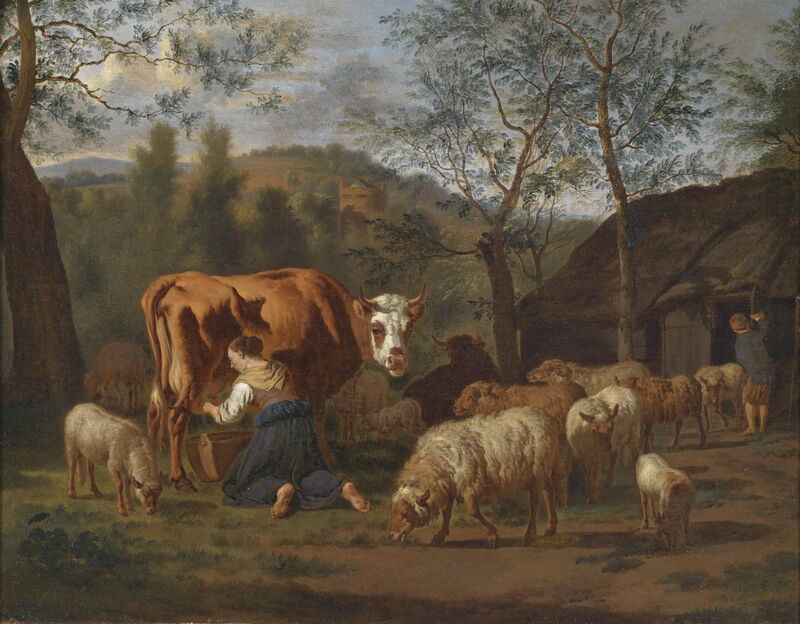 This image of the small undated panel of Cows and Sheep in a Wood is not of particularly good quality, but shows another painting of farm animals which compares with Paulus Potter at his best. 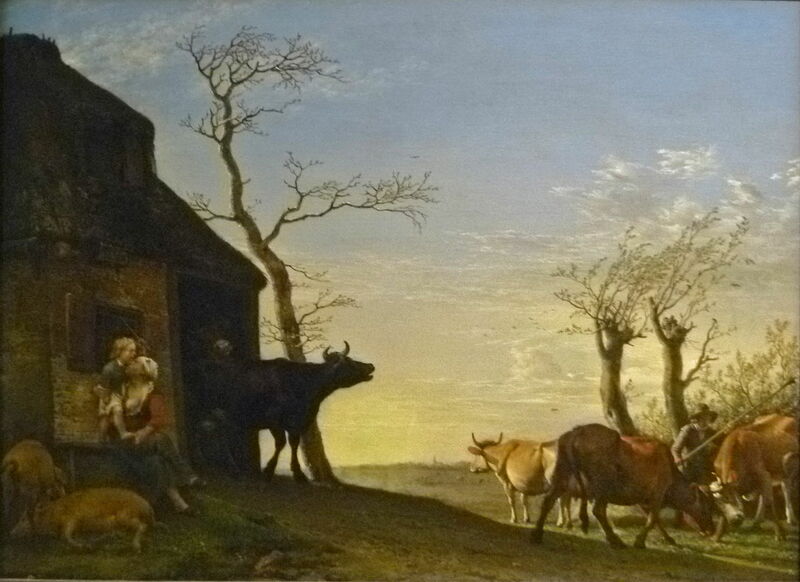 Adriaen van de Velde (1636–1672), A Milkmaid with Cow and Goats in Front of a Barn (date not known), oil on canvas, 32.3 x 40.9 cm, Private collection. Wikimedia Commons. The undated A Milkmaid with Cow and Goats in Front of a Barn is a farmyard delight, with the cow being milked looking directly at the viewer. 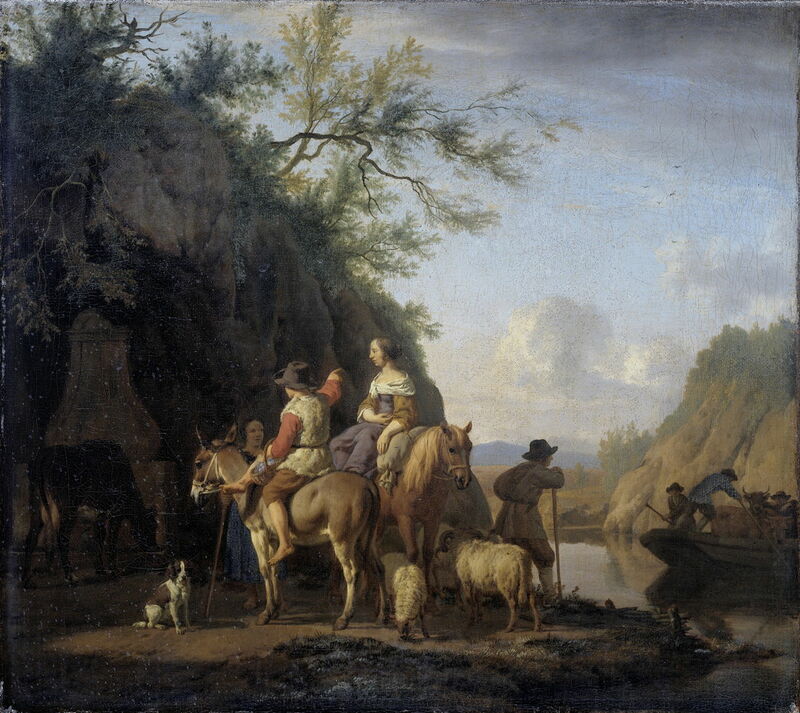 Adriaen van de Velde (1636–1672), Animals by the River (1664), oil on canvas, 50 x 71 cm, Musée du Louvre, Paris. Wikimedia Commons. The rather larger Animals by the River (1664) shows van de Velde’s skill in its twilight sky, and at composing his animals. Another outstanding painting from this period is his A Woodland Glade with Animals and Figures (1664), which I am unable to show for copyright reasons. It can be seen online in the British Royal Collection. Adriaen van de Velde (1636–1672), The Ferry (1666), oil on canvas, 34 x 37.5 cm, Rijksmuseum Amsterdam, Amsterdam. Wikimedia Commons. In the late 1660s, van de Velde painted increasingly complex figures and compositions, such as The Ferry (1666). 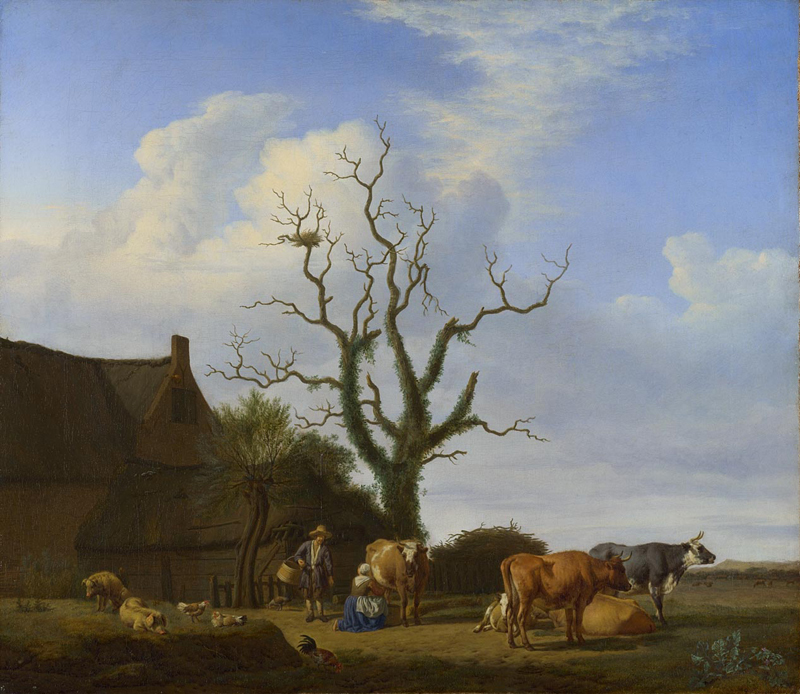 Adriaen van de Velde (1636–1672), The Koekamp in The Hague (The Farm) (1666), oil on canvas mounted on panel, 63 x 78 cm, Gemäldegalerie, Staatliche Museen, Berlin. Wikimedia Commons. 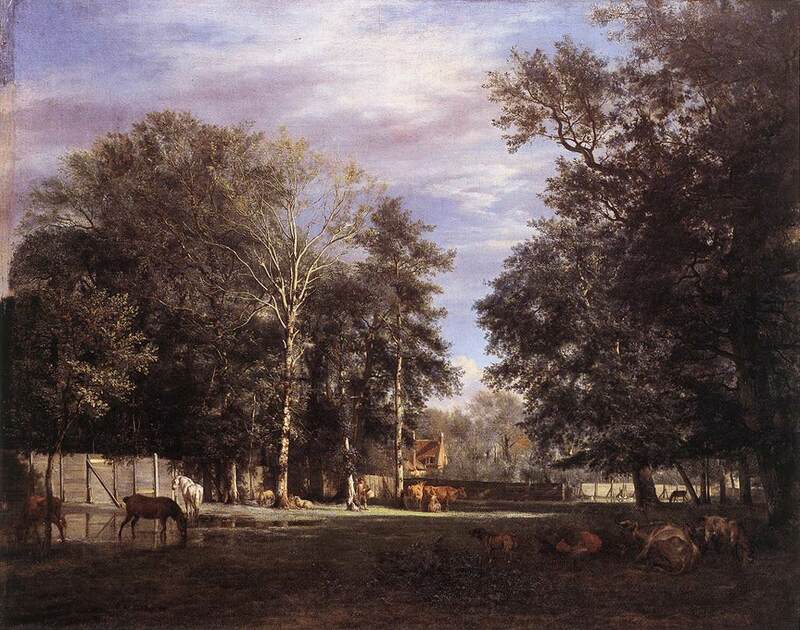 Sometimes known as The Farm, this painting shows a deer park, The Koekamp in The Hague (1666). Its composition has inspired many subsequent landscape painters, and it uses sunlight to brilliant effect. 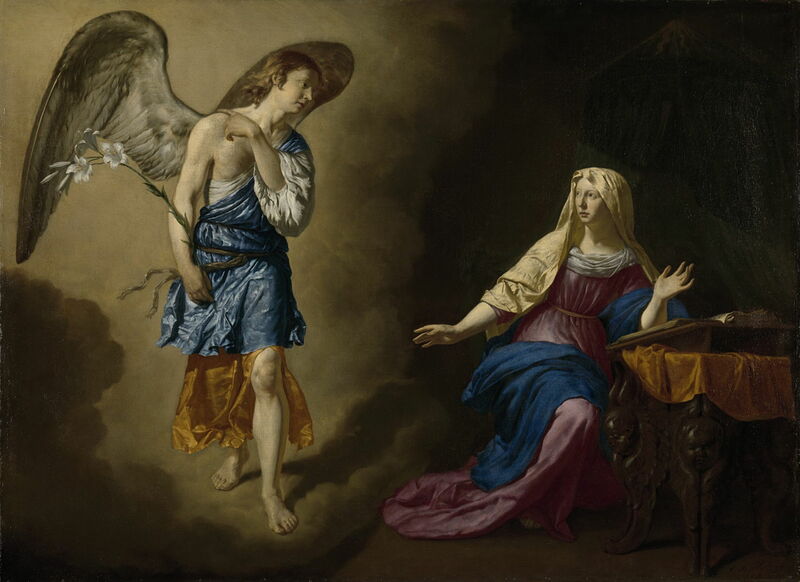 The Annunciation (1667) is a large canvas, and among the few religious paintings which van de Velde made following his marriage to a Catholic woman, and conversion to Catholicism. Although the angel is a little awkward, it is hard to believe that this was painted by a landscape specialist, and it makes me wonder what he might have produced had he enjoyed a longer career, and developed his figure painting further. Adriaen van de Velde (1636–1672), Portrait of a Family in a Landscape (1667), oil on canvas, 148 x 178 cm, Rijksmuseum Amsterdam, Amsterdam. Wikimedia Commons. 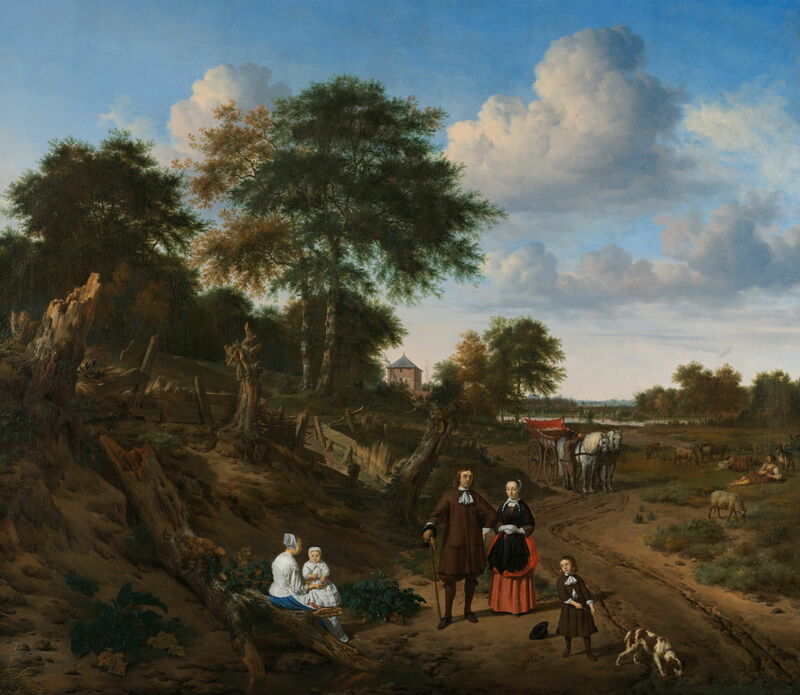 For many years in the nineteenth century, Portrait of a Family in a Landscape (1667) was praised as being van de Velde’s masterpiece, and assumed to be a self-portrait. Although it slowly fell from grace, and it became clear that it was not by any means a portrait of the artist and his family, the painting held further secrets. X-ray studies have led to the conclusion that it has been cut down considerably, and originally placed the nurse and infant near the centre of the canvas. Infra-red studies have shown that the figures were not painted into reserves, as would have been expected in a portrait of this type, but overpainted on what must have been a completed landscape. No one has yet cast any more informed light on its puzzling history. 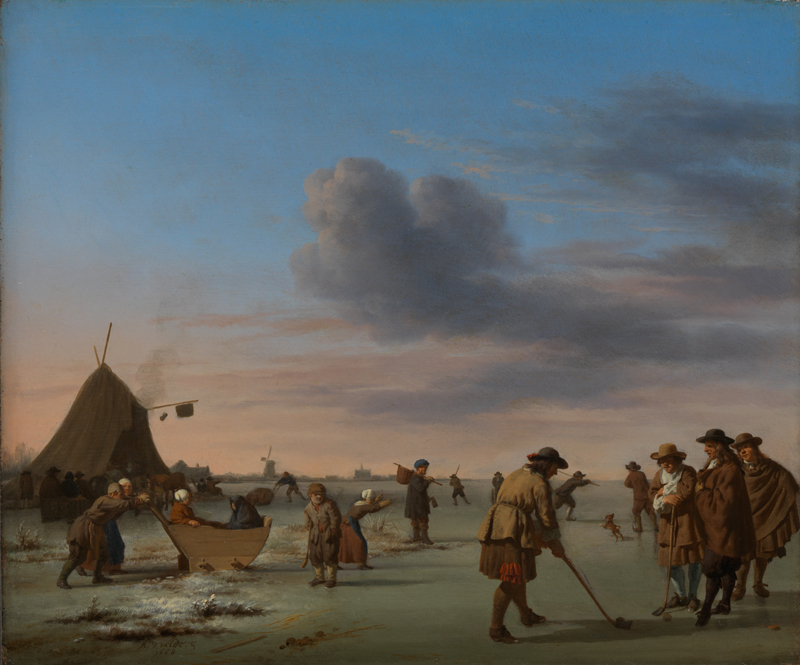 Adriaen van de Velde (1636–1672), Colf players on the Ice near Haarlem (1668), oil on oak, 30.3 x 36.4 cm, The National Gallery (Bought, 1871), London. Photo © The National Gallery, London. Colf Players on the Ice near Haarlem (1668) is one of a small number of van de Velde’s winter landscapes which have survived, and an even more moving twilight sky. The game of colf is popular in Dutch winter landscapes, and shown particularly explicitly here. This work was also popular in the nineteenth century. Adriaen van de Velde (1636–1672), Vertumnus and Pomona (1670), oil, 76.5 x 103 cm, Kunsthistorisches Museum, Vienna. Wikimedia Commons. The problem with van de Velde’s greens is all too sadly evident in his otherwise superb Vertumnus and Pomona (1670). Vertumnus was the Roman god of seasons and change, who could assume whatever form he wished. 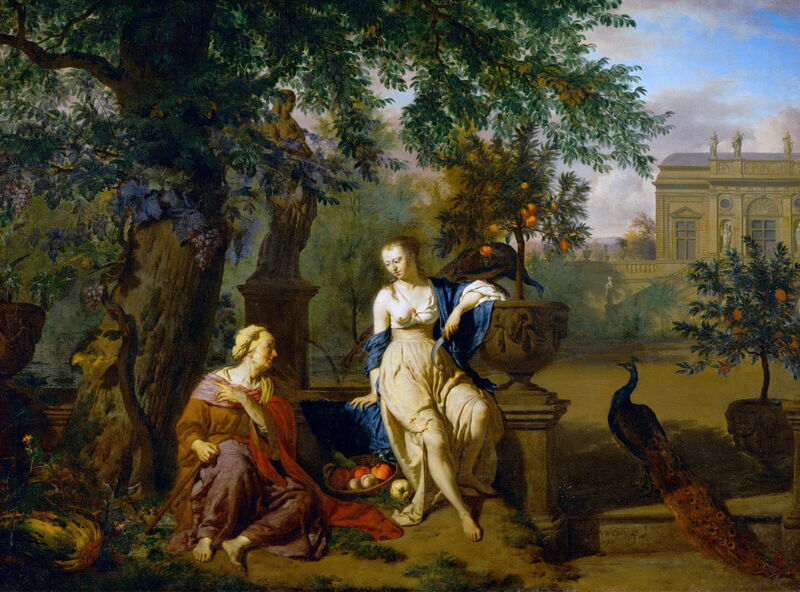 Ovid’s Metamorphoses (Book 14) tells the story of his metamorphosis into the form of an old woman, seen on the left here, so that he could gain entry to Pomona’s orchard and seduce her. The Hut (1671) was one of van de Velde’s last paintings, and has long been esteemed in the Netherlands. It is one of his most natural compositions, sparkling with bright colour in the clothing and animals. The artist even adds the reality – perhaps with a touch of humour – of some fresh cowpats. When he died in Amsterdam in January 1672, at the age of only 35, Adriaen van de Velde left more than 170 oil paintings and a large number of drawings. Later that year, the Franco-Dutch War broke out, driving his father and brother to London, where they completed their careers. Unlike many short-lived artists, Adriaen van de Velde’s reputation continued to grow after his untimely death, and Eugène Boudin – a major pre-Impressionist painter and influence on Monet – was particularly keen on his beach scenes, making a copy of at least one of them. I can see why his paintings are now in many of the major collections around the world. Adriaen van de Velde: Dutch Master of Landscape is at the Dulwich Picture Gallery in London until 15 January 2017. Full details are here. Cornelis B & Schapelhouman M (2016) Adriaen van de Velde: Dutch Master of Landscape, Paul Holberton. ISBN 978 1 907 37296 4. Posted in General, Painting and tagged Boudin, cattle, Golden Age, landscape, Monet, painting, Potter, van de Velde, van der Heyden. Bookmark the permalink.